James Madison University senior Joanna Pottle has won a 2019-2020 Fulbright award to study in Poland. Pottle is the first undergraduate student in JMU’s School of Art, Design and Art History (SADAH) to receive a Fulbright. She applied to the Fulbright U.S. Student Program for one of 12 “Open Study/Research Awards” to Poland, and was awarded a nine-month grant for her artistic/research proposal. “It’s extraordinary,” says Pottle of her win against master’s and doctoral candidates. Pottle, who is the 12th Fulbright winner at JMU since 2009 and the first to go to Poland, began investigating the Fulbright application process at JMU in March of 2018. “I’ve had so many people help me with this process, including my family and people at JMU" like Dr. Sirpa Kokko, one of only a few visiting Fulbright Fellows to JMU—and the first from Finland. “Sirpa was a final set of eyes and made sure my application made sense from a European perspective,” says Pottle of the University of Helsinki craft educator to SADAH during the Fall 2018 semester. Pottle will graduate with a B.A. in art history, a B.F.A. in art studio with a concentration in painting and drawing, and an art education licensure in May 2019. She will fulfill her Fulbright from October 2019-June 2020 in Poland, where she will spend the majority of her time in Kraków at the Jan Matejko Academy of Fine Arts and the Museum of Contemporary Art in Kraków (MOCAK). At the MOCAK, Pottle will help with English-based artmaking workshops for locals, exhibition design and translation, and docent-related activities. 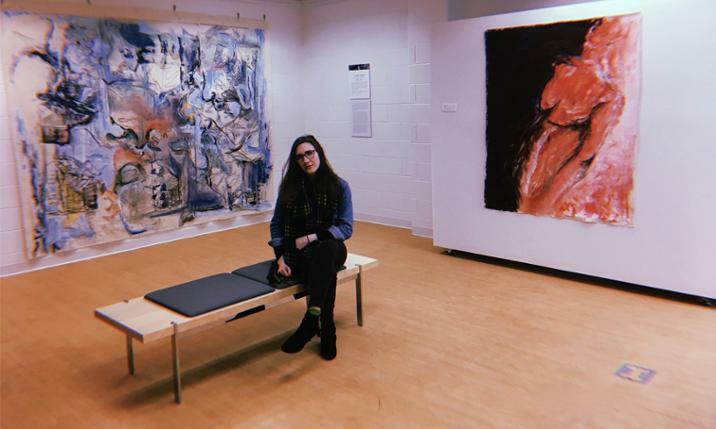 At the Jan Matejko Academy of Fine Arts, Pottle will further her JMU thesis on trauma and dysfunction, a collaborative mixed media painting and printmaking project that involves working with students at the Academy for possible showcasing at the MOCAK. “In addition to having a phenomenal history of printmaking, the Polish have a history of experiencing different kinds of trauma. They have used art as a means of combatting it,” shares Pottle. The Fulbright U.S. Student Program is the largest U.S. exchange program offering opportunities for students and young professionals to undertake international graduate study, advanced research, university teaching, and primary and secondary school teaching worldwide. The program currently awards approximately 2,000 grants annually in all fields of study, and operates in more than 140 countries worldwide. The Fulbright U.S. Student Program at JMU is supported by the Center for Faculty Innovation, the Center for Global Engagement, and the Office of Access and Inclusion.